How do you save a city that is dramatically declining like Detroit? Well, for the mayor of Detroit the answer is simple – you bulldoze one-fourth of the city. Faced with a 300 million dollar budget deficit and a rapidly dwindling tax base, Detroit finds itself having to make some really hard choices. During the glory days of the 1950s, Detroit was a booming metropolis of approximately 2 million people, but now young people have left in droves and the current population is less than a million. The true unemployment rate for those still living in Detroit is estimated to be somewhere around 45 to 50 per cent, and poverty and desperation have become entrenched everywhere. In many areas of the city, only one or two houses remain occupied an an entire city block. In fact, some areas of Detroit have so many vacant, burned-out homes that they literally look like war zones. And yes, it is true that there are actually some houses in Detroit that you can actually buy for just one dollar. According to one recent estimate, Detroit has 33,500 empty houses and 91,000 vacant residential lots. So what can be done when an entire city experiences economic collapse? 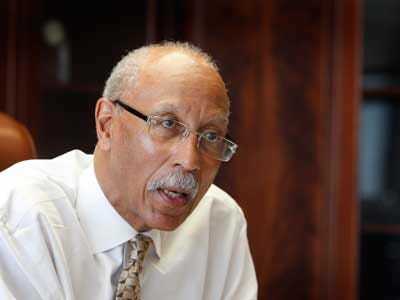 Well, Detroit Mayor Dave Bing (pictured) believes that the answer is to downsize on a massive scale. Bing believes that Detroit simply cannot continue to pay for police patrols, fire protection and other essential services for areas that resemble ghost towns. So his plan is to bulldoze approximately 10,000 houses and empty buildings over the next 3 years and direct new investment into stronger neighborhoods. In the areas that the city plans to bulldoze, the residents would be offered the opportunity to relocate to a better area. For buildings that have already been abandoned, the city could simply use tax foreclosure proceedings to reclaim them. Of course if there were some residents that did not want to move, eminent domain could be used to force them out. So which areas would be bulldozed and which areas would be left standing? Nobody knows yet, and those decisions could make a lot of people angry. Also, the city of Detroit simply does not have the money to purchase land and relocate residents without federal assistance. But other smaller cities are already doing this kind of thing on a smaller scale. The city of Youngstown, Ohio has been bulldozing a few hundred houses a year since 2005. Flint, Michigan has already torn down approximately 1,100 houses mostly in outlying areas. The program in Flint was actually the brainchild of Dan Kildee, treasurer of Genesee County, which includes the city of Flint. In Flint, no residents are forced out of their homes unwillingly. Instead, the city has been buying up houses in more affluent areas of Flint to offer to those in areas that the city wishes to bulldoze. The program in Flint has been so successful that Mr. Kildee has been asked to help implement it in other cities that are in decline. And there are a whole lot of U.S. cities that are in a serious state of decline – mostly in what is known as “the Rust Belt” of America. Because of reckless U.S. trade policies, the once great U.S. manufacturing base centered in the Rust Belt has been dismantled and those jobs simply are never going to come back. So now cities like Detroit and Flint are faced with either dealing with the economics of decline or going bankrupt for good. But the truth is that Detroit and Flint are just on the cutting edge of what is happening to America as a whole. The U.S. is experiencing a very painful economic decline, and what is happening in Detroit and Flint could happen in your city very soon.